What is gym etiquette for meets for the people and parents in attendance? Some parents were cheering so loud at a USAG Level 5 state meet that girls could not hear their floor music and 2 girls fell off the beam. They were so loud that several announcements were made, but it didnâ€™t stop!! Do you have any articles that I can mail to that gym to pass on to the parents. I never thought that I would write an article on etiquette of any kind. 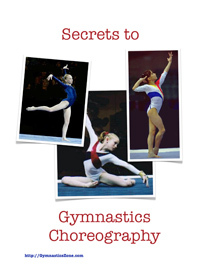 My previous writings on meet topics included tips and the closest I ever got to talking about etiquette was about parents not communicating with their gymnasts and staying on the competition floor (more of a rule than etiquette). Besides gymnastics has traditionally been a very respectful sport with considerate fans who were appreciative of the time and effort put into training for gymnastics meets. If anything, often meet directors should be encouraging the spectators to be more demonstrative with their applause. But we have seen and have received more and more comments of inappropriate spectator behavior over the last few years and feel compelled to comment. If at any time or in any way, cheering (or screaming would be a better description) begins to interfere with the competitive efforts of another gymnast, it is inappropriate. When parents along with a gym owner are cheering so loud at a compulsory USA Gymnastics State Championship Meet that girls cannot hear their floor music playing and have to start their routines over, this is unacceptable behavior for gymnastics fans. Hats off to the judges who took the rules into their own hands and allowed the gymnasts to redo their routines, but this is not something that should be happening to gymnasts, especially at a compulsory level gymnastics meet. And parents screaming so loud that two young compulsory level girls were so startled that they fell off beam are so far out of line with their FANatic behavior that there is no doubt that this is far beyond acceptable behavior in our sport. Again, the intervention of the judges allowing the gymnasts to repeat their beam routines is admirable, but damage was already done to the girls’ confidence as a result of the fall. Who would have ever thought that the judges would have to reinterpret the rules to allow compulsory level gymnasts a fair chance due to fan interference. FANatical team screaming, that even pleas from the meet announcer were unable to stop, is simply not acceptable behavior and should not be tolerated. We know there is no rule in our sport banning such behavior and we don’t support penalizing gymnasts for the bad behavior of their parents, we do believe that gym should be publicly reprimanded for this type of behavior so that everyone is clear that such behavior is not acceptable. Visually assaulting a gymnast with a camera flash is unacceptable as evidenced by announcements to that effect at meets. Assaulting their hearing verbally should be viewed as equally unacceptable behavior. We are not advocating the complete silence that is traditional to tennis matches. We want gymnasts to feel they are being supported. Heaven knows we feel gymnasts are among the least rewarded of all athletes. But respect must be shown and fairness must rule when other gymnasts are competing, especially at meets that are the most important competitions of the year for young gymnasts. Frankly, it is difficult to believe that this type of FANatical screaming would be anything other than extremely embarrassing to the gymnasts it was supposedly presumed to support. The gymnasts we know appreciate the support of their parents, families and others from their gym, but shy away from overly demonstrative demonstrations of support just as a part of their gymnast personality. We are aware that there is some precedent for such a problem. We know that in International gymnastics (and other sport) competitions, the Swiss fans have always beat on their annoying cowbells (having sat behind them at one World Championship session, I can personally attest to this). But here we are talking about older and more seasoned gymnastics competitors (and the Swiss never seem to have really good seats so they are not usually so close to the competitors as to interfere). There were also complaints at the Atlanta Olympics about crowd noise from the predominantly American fans that interfered with some of the performances of gymnasts from other countries who might have had a better chance to place and medal without the distraction of such a loud crowd. Again, we are talking about older and more seasoned gymnastics competitors here. My analysis of the crowd noise was not that it came from inappropriate cheering (screaming), but that simply the sheer volume of noise primarily came about because of the large number of American fans who predictably cheered at the same times (when US gymnasts finished their routines). U.S. gymnasts sometimes experience the same problem when they compete abroad. We personally appreciate the long hours of hard work gymnasts put in regardless of whether they are our gymnasts or not. We are certainly root for our own gymnasts to win at competitions. But we have great respect and appreciation for the talent and hard work of gymnasts on other teams and enjoy watching them show off the results of their labors at competitions. We train our team gymnasts to root and cheer for all of the other gymnasts on our team. We also teach our team members to look for other gymnasts, especially those in their rotation who may be alone, who would appreciate support from other gymnasts when they are competing. Parents, fans, gym owners and coaches should show the same respect to the performances of others that they would like to have shown to their own gymnasts. Everyone involved in the sport should go out of their way to ensure that each and every gymnast has a fair chance to demonstrate their talent and hard work at every meet and on every event. Coaches and gym owners: Take the responsibility to inform your parents and fans what is acceptable. Either in written memos or at team parents meetings before next season, explain to parents what kind of reputation you want your gym and gymnasts to have and how their fan behavior at competitions influences that.